good news for the teachers who are looking for a government job in Andhra Pradesh Government Schools. As per press release APDSC notification will be issued on 26-10-2018. Online applications for this APDSC Exam 2018 will be accepted from 01-11-2018 to 16-11-2018. 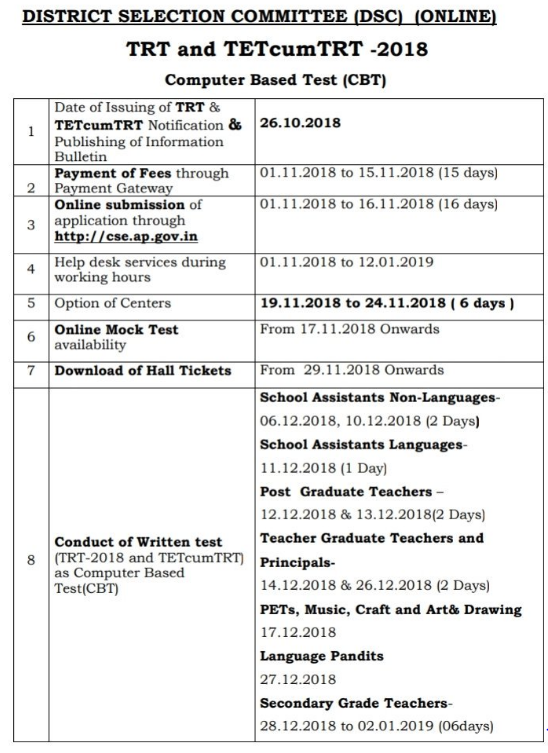 AP DSC TRT Exam will be conducted from 06-12-2018 to 02-01-2019. There are total 10351 teachers vacancies in Andhra Pradesh Govt Schools, ZP Schools, MPP Schools, Municipal Schools and other schools which are running under AP Government. 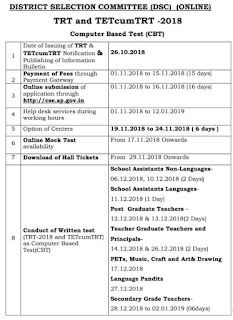 Online applications only accepted for this APDSC Teachers recruitment Exam notification 2018. This is a news only which is released by Human Resources Minister of AP Mr. Ganta Srinivasa Rao, official notification is yet to release. Post wise teachers vacancy details, qualifications, and other details of APDSC Exam 2018 is given below. There are total 10371 Teachers jobs in all over Andhra Pradesh Government Schools. Upper age limit for OC candidates is 42 years. For SC/ST/BC candidates upper age limit will be 47 years. For PH candidates upper age limit is 50 years. Candidates selection will be purely based on APDSC Exam marks only. For SGT's and PET written exam will be conducted for 180 marks. For other posts written exam will be conducted for 200 marks. Candidates who are having the necessary qualifications they can apply online on or before the closing date through official website of APDSC.